The Mountain Khakis Qtr Zip Rendezvous is a pull-over sweater with an 11.25 inch (28.6 cm) YKK® Reverse Coil Locking Zipper. This zipper extends from about mid-chest level to the very top of the stand-up collar which happens to be about 3 inches (7.6 cm) tall. The shirt has Lycra®-Bound Thumb Loops on the 2.75 inch (7 cm) cuffs. There is a zippered front pocket called the Napoleon Left Chest Pocket that measures approximately 5.5 x 5.5 inches (14 x 14 cm) square. For reference, my iPhone 5 (inside its OtterBox Defender case) fits in it either horizontally or vertically with room to spare on the sides but none on the long axis. Here is a picture of the pocket with my hand inside. The fabric is listed as 8.8oz, 300g, 21.5 Micron 100% Washable Merino Wool Jersey Knit. I originally misread that to mean the shirt weighed in at 8.8 oz, but realized it was only talking about the weight of a yard of fabric when I found it weighed almost double that. To aid in comfort and fit the shirt features flatlock seams and the signature MK Back Yoke. The placement of the only logo on the shirt is on the back near the right shoulder. It is embroidered onto the shirt and I was a little concerned it might cause rubbing when wearing a pack. However, a quick donning of my backpack proved it was well outside of where the shoulder strap is located. Here is a photo of the logo from the inside and one from the outside while wearing my day-pack. Other notable features of the shirt are that it is Athletic Fit and machine washable. The care instructions are printed on a small tag located on the inside left side of the shirt down near to bottom hem. They state: Machine wash cold, Do not bleach, Do not tumble dry, Do not iron, Do not dry clean and Lay flat to dry. Colors available are Black, Clear Blue and Rooster, which also happens to be the color I am testing. I would describe Rooster as a burnt orange. The first thing I look for in a shirt is how well it fits, because while not as critical as with shoes, it could be the greatest thing since sliced bread, but if it fits poorly I will not be happy with it. Fortunately, the Rendezvous fits just about perfectly. In fact, if the sleeves were just a tad shorter, I doubt a tailor could make it fit any better. I am a pretty hefty guy at 6 ft (1.8 m) tall and weighing in at around 250 lb (113 kg). I do have broad shoulders and a long waist but I consider my arms about average length. Anyways, the shirt fits very comfortably and felt great when I wore it to town one afternoon and then to church later that night. One thing I did notice was that when holding a song book or my iPad Mini the sleeves were twisted if I used the thumb loops. It was not uncomfortable, but, I could feel a little pressure on my thumbs, and more than when I was just walking around in the shirt, thumbs in the thumb loops and my arms hanging at a natural angle. Here is a photo of the twist. After closer inspection I have decided that the thumb loops might be better served if placed on the opposite sides of each sleeve. This is because if I just put the shirt on and observe where the thumb hole ends up, it ends up on the opposite side of my thumb, like this. After having just worn the shirt a few times I am impressed with the comfort. I have worn it alone and found that the Merino Wool is not scratchy at all. I also wore it over a tee-shirt, and again, it was very comfortable. It was around 50 F (10 C) the first time I wore it and it felt good at that temperature. I had on the tee-shirt under it so I could remove the shirt to weigh it and it slips on and off easily. I also weighted it on two separate scales (feed supply and post office) and both came up with the same 15.5 oz (439 gm). It has since warmed up so I have not had a chance to wear it in cooler temperatures but I did notice it felt fine with the outside temperature at around 70 F (21 C). However, I felt even better in just a tee-shirt. Based on my previous positive experiences with Merino Wool I am anxious to see how this shirt performs, both alone and when layered in colder temperatures. This concludes my Initial Report. All testing took place near my home in North East Alabama. This has been one of the coldest winters on record in our area, however, being this far south has meant a good mixture of cold and not so cold weather. The coldest testing of the Rendezvous was on a cold morning when the low was 2 F (-17 C) but I waited until it warmed up to 5 F (-15 C) before heading outside for a short one hour day hike on a local trail. I'm not sure what the warmest temperature I encountered was, but, I went on several day hikes when temperatures were well below freezing as well as other times when it was near 60 F (16 C). I went on two overnight hikes. The low on the coldest overnight was 26 F (3 C). The low on the other overnight hike was 41 F (5 C). I experienced sun, rain, sleet and a little snow while wearing the shirt, however, most of the time it was just cloudy, cold and windy. I also wore it while cutting firewood, hunting and just a little while riding my recumbent. 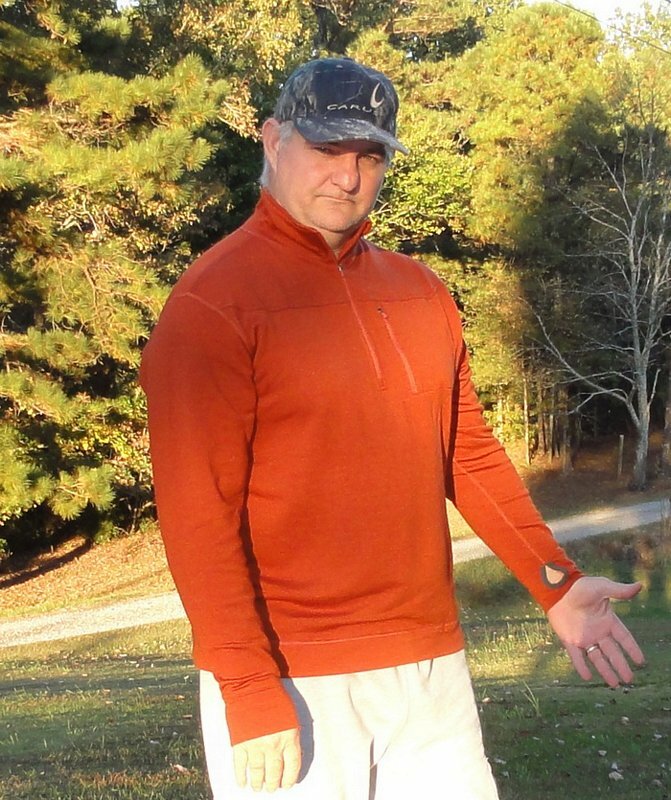 I have enjoyed wearing the Mountain Khakis Qtr Zip Rendezvous. It has proven to be a very versatile item of clothing. The first time I wore it backpacking I wore it while hiking and then as part of my sleep gear since the temperature well below the 43 F (6 C) comfort rating of my bag. I had a cotton/poly blend tee shirt on as my base layer and wore only this under the Rendezvous during the hike but upon arriving at my campsite I put on a light rain jacket. Nonetheless, I got rather chilly before turning in for the night. It dropped to 26 F (3 C) but I managed to stay relatively warm most of the night by wearing all I had with me. Well, except for my feet, my socks were damp from hiking and I should have taken a dry and thick spare pair, maybe even two. I wore the Rendezvous while deer and squirrel hunting. I got sleeted on once while deer hunting. On one squirrel hunt I hiked about 5 miles (8 km) total. I had on a pretty thick camo jacket over the Rendezvous and a long sleeve medium weight base layer under it. I had placed my cell phone in the zippered pocket of the shirt. It was about 30 F (-1 C) when the hunt started but had warmed to around 40 F (4 C) by the end of the hunt. There was quite a bit of climbing involved and I failed to take my jacket off. As a result I worked up a pretty good sweat. My phone was in an Otter Box Defender case but the front had a slight crack in the plastic and apparently I was producing a lot of steam...The phone screen was so damp I could barely read it. I took the case off and wiped it dry immediately to avoid possibly damaging it. I say this to say that the Rendezvous was very comfortable even though I was sweating profusely. After getting home and letting the shirt dry it really did not smell all that bad (too me anyways). It took it a few hours to dry while I was wearing it but after this I decided to go ahead and wash it. I used the delicate cycle on my washing machine and then hung it over the deck to dry. It dried in the afternoon sun in just a couple of hours and looked about as good as new. I was pleased to see it did not shrink. On the other overnight trip I wore the Rendezvous as my only top layer. Of course it was only 55 F (13 C) when hiking to my campsite and had only dropped to 50 F (10 C) by the time I turned in around 9 PM. I slept for the first half of the night with my bag pretty open but did zip up from 3 AM until I got up at 5:30 AM. By now it had dropped down to 41 F (5 C) In addition to the shirt I had on a pair of sweat pants and some thick sock but all my clothing and the sleeping bag felt dry when I got up. However, my hammock was actually a little damp from the hip area up to where my shoulders were positioned so I left the hammock hanging and hiked home wearing a light down jacket over the Rendezvous. My pack only had my sleeping bag, light, water and a few other items. I wore the Rendezvous under my down jacket a few hours later when I went back to my campsite to take down my now dry hammock but left the pack at home this time. I made it home the last time just before it started snowing. My biggest concern was that wearing the Rendezvous by itself might prove to be itchy but it turned out to be very comfortable. No, not as comfortable as a good old cotton tee, but close enough that it was not a problem. My results while wearing the shirt on day hikes was also positive. It kept me pretty warm just wearing it over a thin base layer unless it was either really cold, windy or a combination of both. I would sometimes wear a light rain jacket or a light down jacket over it as needed but often ended up packing those away when I warmed up. One thing I did not use very often was the thumb holes. As I mentioned in my Initial Report, I felt like they were positioned on the wrong side of the sleeve. However, the main reason I did not use them is I am not accustomed to them and would have to make a conscious effort to remember to use them. And since the sleeves never tried to ride up my arm I did not really see much benefit in using them. I'm fine with their presences as they did not seem to let cold air in on my wrist enough to bother me. 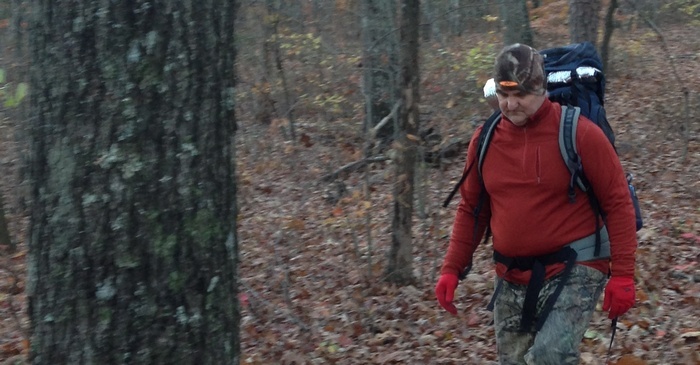 Here I am down in the holler on a chilly morning after a few days of sub-freezing weather. It was about 35 F (2 C) when this photo was taken. Yes, it does get cold in Alabama! I have continued to wear the Mountain Khakis Qtr Zip Rendezvous a lot, but recently the temperatures have increased enough that I was not as comfortable in the shirt as when it was cooler. Most of my wearing has been on more day hikes but I did manage one more overnight hike. I carried it on a trip to Kentucky but did not have an opportunity to wear it then. The lowest temperature encountered while wearing the shirt during this phase was probably about 25 F (- 4 C) on a walk around the Air Force Base while visiting my daughter in Arkansas. It was spitting snow and a very cold wind was blowing. 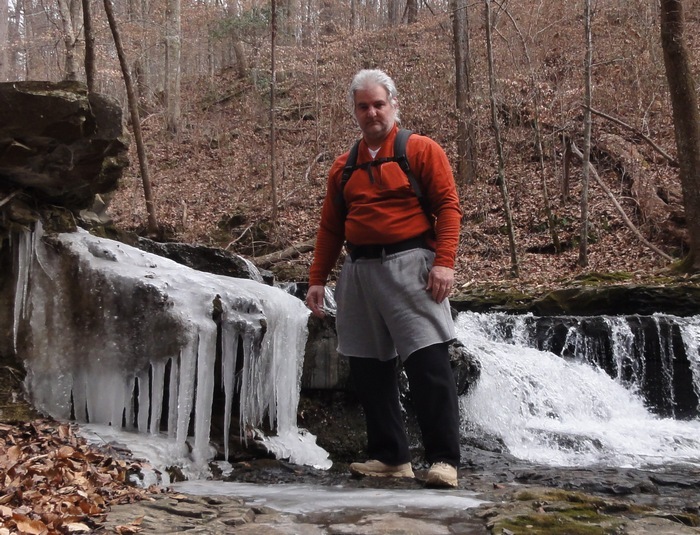 The warmest was probably a few days ago when I wore it at around 65 F (18 C) on a day hike to the holler behind my house. I wore it once kayaking when the temperature was about 60 F (16 C) but left it at home while kayaking a few weeks later when the high was around 70 F (21 C). I don't have a lot of new data to share but I will say that I have continued to be impressed with the performance of this shirt. It is truly comfortable over a wide range of temperatures. I will have to say that when it got up to around 60 F (16 C) and higher the shirt kept me a little warmer than I prefer. On the plus side, even though I would sweat in the shirt it kept me feeling dry except for my under-arms. I have also continued to be impressed with the shirts ability to resist developing a strong odor while wearing it and especially after letting it dry and air out for a day on my back deck. On my last overnight hike I wore the Rendezvous while hiking about 2 miles (3 km) to my campsite with temperatures at around 60 F (16 C). The shirt got a little damp on the hike to camp but was dry after a couple of hours and before I turned in for the night. It dropped to 44 F (7 C) overnight and I wore it as a sleep shirt and then hiking home the next day. I did not have anything other than my pack over the shirt for the hike to my campsite but did wear a light rain jacket on the hike home. I actually believe I would have been fine without the jacket but I just started testing it and wanted to see how the jacket handled sweat. During the entire testing period of about 4 months I only ended up washing the Rendezvous four times because I could wear it three or four times between each washing. I am happy to report that washing it using the delicate cycle on my front load washing machine and drying it by hanging it over the rail on my deck has not cause the shirt to shrink at all. If anything, I think it fits a little looser now than when the test began. My only departure from the recommended care instructions was hanging it over the rail instead of laying it flat to dry but this has not seemed to cause any problems. For the record, the detergent I used each time was All Mighty Pacs made for high efficiency washers. From an overall durability standpoint I would have to say the shirt is great. I don't see any tears or picks, the color has not faded and it has not started piling. The Mountain Khakis Qtr Zip Rendezvous works as advertized as a base or mid layer. It stinks much less than any of the synthetic fabric shirts I own and despite being wool, does not itch at all. It wicks away sweat reasonably well and dries quickly when I cool down enough to stop sweating. I will say that Merino Wool garments are usually more expensive than their synthetic counterparts, but the benefits outweigh the extra cost in my honest opinion. This concludes my testing of the Mountain Khakis Qtr Zip Rendezvous. I would like to thank Mountain Khakis and BackpackGearTest.org for this testing opportunity.